In 1950's London, Reynolds Woodcock (Daniel Day Lewis) is a renowned dressmaker, at the centre of fashion with his sister Cyril (Lesley Manville). His lifestyle is disrupted by the arrival of Alma (Vicky Krieps), a strong willed young woman who becomes his muse, and his lover. If this is indeed Daniel Day Lewis' farewell performance, then it's safe to say he's going out on a high note. He puts phenomenal work into the role of Reynolds Woodcock, a man who carries deep seated mommy issues, and deeply misses her. He recalls a wedding dress he made for her with great nostalgia, and even has a lock of her hair sewn into his garment, to always keep a piece of her with him. He lives a routine orientated lifestyle, and one can sense his coiling anger when it's upended, no matter how well meaning the actions are. He believes there must be utter silence during breakfast, for is Reynolds doesn't get off to a good start, he won't recover during the day. The mere act of spreading butter on toast is likened to riding a horse through the room, and a surprise dinner for two is considered an "ambush". At the centre of the film is Reynolds' relationship with Alma, his muse whom he falls for. It's an unconventional romance, as one waits for the other shoe to drop, and for Reynolds to discard Alma to one side, as he's done with prior muses. Putting her all into the role is Vicky Krieps, who manages to prove herself as Day Lewis' equal, with a performance that's just as compelling. As the two exchange words, one feels as though in the presence of two expert swordwielders, parrying one another's blows with the utmost precision. Lesley Manville puts a brilliant performance into her role of Cyril, sister of Reynolds. She acts as keeper to her brother, helping to manage his business as well as his personal life, while bending to his whims. Just as Cyril supports her brother, Johnny Greenwood delivers a score which stupendously gives assistance to the picture, helping to envelop viewers into the tale. What's also worth mentioning is how very funny the film is, with the scathing wit which leaves the characters mouths proving hilarious. One highlight sees our lead duo disapproving of somebody acting disgracefully in one of their dresses, leading to them taking matters into their own hands. What Paul Thomas Anderson has masterfully brought to the screen is a gripping view into London fashion, through a twisted pairing. 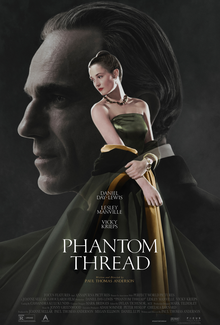 Phantom Thread is a sumptuously composed dark romance led by tremendous performances, which proves engrossing throughout its running time.